During our hike last weekend, my girls and I met up with a family and their three dogs. As we walked, we talked about the hot weather and swapped tips for keeping our kids and pets safe as they play outdoors during the summer. 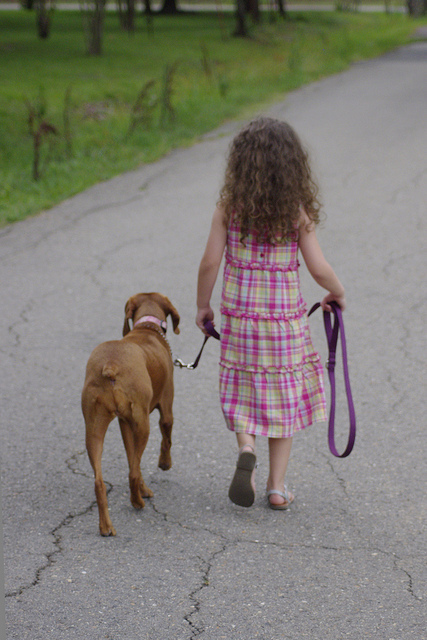 My favorite nine tips can help you keep your kids and pets safe as you hike and play this summer, too. Playground equipment, pavement, and surfaces like black safety mats can exceed 140 degrees even if the outdoor temperature is only in the 80s. Before you let your kids or pets walk or play outside, touch the surface with the back of your hand. Choose a different activity if the surface temperature is unsafe for your loved ones. Every time we head outside to hike or play, we overestimate the amount of water to bring. I definitely don't want to become dehydrated or develop heat cramps, exhaustion, or stroke in the hot sun! Ideally, we bring one liter of water per person for a moderate two-hour hike. To carry this essential hydration, my girls prefer hydration packs instead of bulky, heavy bottles, and I recommend bringing a portable water dish for furry friends. My younger daughter has fair skin, and she can get a severe sunburn even on cloudy days. However, we all generously slather on the lip balm and sunscreen at least 15 minutes before heading outside and again after we've been out for an hour or so or sooner if we're sweating or playing in the water. With adequate sunscreen, we're less likely to get an uncomfortable sunburn as we protect our skin from damage. While my girls prefer wearing shorts and tank tops to stay cool during the summer, these clothing choices aren't protective as they play outdoors. I typically ask them to wear a synthetic fiber or linen wicking layer next to their skin, followed by loose, vented, and breathable white, tan, khaki, or other light-colored shirts and shorts or pants. I also stock their closets with UPF-rated clothing, wide-brimmed hats, and sunglasses that offer extra protection during outdoor hikes and play time. Everyone in my family likes wearing flip-flops, and while this shoe option is great for lounging at home, it's not the best choice for hiking or active outdoor play. Instead, I suggest sturdy hiking or tennis shoes. They support my kiddos' feet and protect them from burns as they play. We wear wool or synthetic socks that fit properly, too, as we keep our feet dry and reduce uncomfortable blisters or pressure points. Hiking near a stream, playing backyard water games, or visiting a water park or the community pool helps our kids and pets stay cool and have fun. My daughters also like wearing neck gaiters during hikes because the evaporating water keeps them cool. One of our local playgrounds features tons of shade, and that's my girls' favorite summer play spot. However, we also like hiking on shady routes where we appreciate the scenery and cooler temperatures. When my girls were younger, they napped after lunch, the hottest part of the day. Now that they're older, they often want to head outside after lunch to play. I encourage them to play outdoors early in the morning or later in the day, though, and we've started taking night hikes to prioritize safety without sacrificing fun. Over breakfast each morning, my girls and I review the daily schedule and plan to have fun while playing safely. For example, they may choose to play in a shaded park in the morning, do crafts at home, or hang out in an air-conditioned library, mall, or museum after lunch and meet friends at the pool or for a hike in the evening. A plan helps us avoid hot temperatures while loading our summer with fun activities. This summer, my girls and I plan to have tons of fun even in hot weather. We follow these nine safety tips that keep us safe. What other safety strategies does your family implement as you keep your kids and pets safe in the heat?